It was the best of times and the worst of times in the GOBN this growing season. The garden survived, but, it didn't thrive. It is after all the Garden Of Benign Neglect and conditions are tough out there! The natives aren't used to pampering. They get by on what nature dishes out each year. So the roughest and toughest tend to 'blossom' and dominate. The pounding rains in May (18 inches in one day) and the drought this summer (70 days without significant rainfall) took its toll. Many plants did not survive, but, I'm not fooled! Heuchera villosa 'Autumn Bride' survived the drought! Under the leaves and amidst the decaying plant materials is the promise of next spring! Columbines, Phlox pilosa, lunaria and Pestemmon X will burst forth next spring~Nothing stops them. 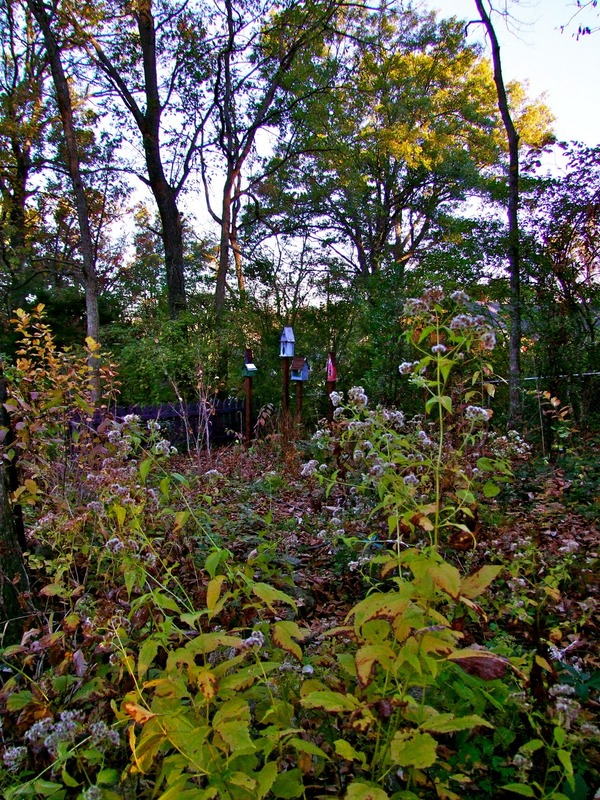 The scutellaria, goldenrods, mistflowers, gaura and asters survived the worst that summer had to give them. We won't know until next spring whether the baptisias and amsonias are still with us! They may have slipped into an early dormancy~Don't we gardeners wear our hope well! The Garden of Benign Neglect is more a spring garden then an all year garden. In February the ephemerals start the parade. By early April the garden is shouting, "Look at me, Look at me". It's lush, it's colorful and you want to sit out there all morning long listening to the birds and soaking up the sweet fragrance of woodland phlox. When the heat arrives in May, the last of the shrubs and small trees have bloomed and the garden retreats into greenery. That's not to say that there aren't Susans and a few other perennials to catch your eye. 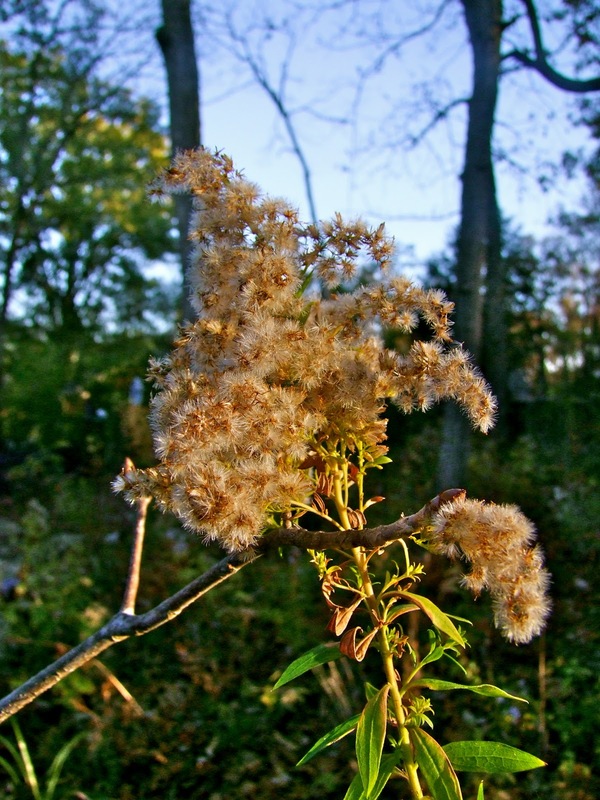 But, it's not till fall that the garden comes back alive with the ex-asters, liatris, native grasses, goldenrods, gaura and autumn leaves. 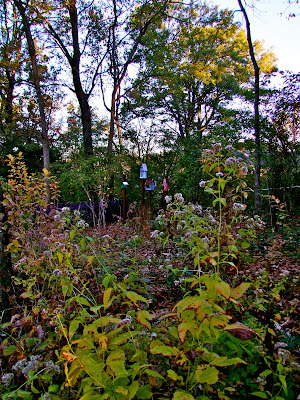 This fall I had planned to rework the garden to give it all year interest. Evergreens and shrubs are needed for structure and perennials need to be grouped and massed for greater effect. September and October were too dry to make changes. Finally, the soil is workable. It's not too late to add the much needed evergreens and shrubs. I might even chance adding a few perennials that have found there way into the carts while visiting nurseries for mulch and soil conditioner. We have frosts and freezes on and off all winter, but, as long as the ground is not frozen we can plant to our heart's content. That's my plan! So, please forgive me if I am not blogging as much~It seems, I am a foul weather blogger. A foul weather blogger? Good one! I love this time of year, as my dreams of next season's growth is just over the horizon....that and the fall color is just gorgeous. Looking forward to your spring garden. Always planning and dreaming of next year. To be able to dig in the garden year round...sigh. Sounds like you'll be busy. Ah, but a foul weather blogger is a fair weather gardener! I'm somewhat guilty of the same, and while our skies are clear, but our soils are damp, I have a lot of planting to do this week! I'm glad your Heuchera survived the drought, and I'll cross my fingers that your Baptisias and Amsonias are simply sleeping, and will reawaken soon. It certainly has been a year! and now that the garden is put to bed I'm starting to fantasize about the great year of 2011. I love your title, Gail! The GOBN will arise again in spring to carry the native colors. Check out the big box stores, things are on sale to make way for...nope, not going to say it yet, but you might find some goodies there. I love the photos with the light streaming through the trees. I am a great one for gardening past the usual dates for gardening. I still have a pile of bulbs to be planted! I call it extreme gardening and I have the frozen fingers to prove it! Happy gardening. We're gardeners first, bloggers second, so we understand when it's a choice between gardening and blogging, gardening wins. Let's hope next year is more kind to the garden. No neglect, just full of native plants. The spring shot is beguiling and the fall shots look serene with the low sun shining. Cold, snow and rain will be there soon enough. Enjoy. Plant away, Gail, and blog on the rainy days. We look forward to seeing all the changes. It's great that you're getting ready for next year...that is one of the best parts of gardening. I'll bet you money that the Baptisia and Amsonia went dormant... Amsonia in my garden has gone dormant midsummer many times. Wonderful post and wonderful images Gail. If you're having the same golden weather we're having this week, it's no surprise you're out in the garden! We gardeners do wear our hope well! I love that line. I bet the GOBN comes back wonderfully next spring. I don't blame you for being out in the garden with such nice days. I hope you get lots done! My days in the garden are almost over. boo hoo. I'm going to have to toughen up, like your native perennials, so I can be out during the winter months. Happy planting! I'll be interested to see what you decide to plant, evergreen wise. I hope your weather this winter is not as extreme as your spring and summer were. I love the idea of having all winter to plant! I've got a lot of plants that died back early because of drought - clinging to the thought it's early dormancy also. Lovely photos of a natural looking, beautiful gardening space! I love the GOBN Gail. This is a great season for planting here too. I have some ideas swirling around in my head as well. I have been thinking that I need to add more perennials in my gardens....any suggestions? You have a milder season than mine. I had the opposite I think, we had record rains.It swamped many seeds I put out by covering them more. I lost a variety of veggies, and with excess of weeds my garden helpers sometimes weeded new plants.I have enjoyed what you have shared. A definite emphasis on the "benign" I think! I love the jewel-like lusciousness of the Spring look. Plans sound wonderful, there will soon be plenty of foul weather to blog in, enjoy your gardening while you can! Hope springs eternal in the gardener's heart. Plant away, Gail. There will be plenty of time to blog on blustery winter days, when all you will want to do is sit by the fire and look out at GOBN, cozy and warm, sipping on a cuppa warm something. Oh, the first photo with sun through the trees and the photo of the bench in spring are so magical. I still can't believe that you had 18 inches of rain in one day, although I know it does rain differently out there. I remember being amazed when it 'rained buckets' in Iowa. It just doesn't rain like that over here in the Northwest. As for Crocus speciosus, they have to ship them in September while they're free of leaves or flowers. So order early next year and you'll be fine! I too am more of a foul weather blogger! I have a hard time spending beautiful fall days inside. I'm also working to add more plantings for year-round interest. Here's to success for us both! Gail, you are a true gardener! Seeing the promise of next year's beauties beneath the dying foliage is the perfect example of hope and optimism, something a real gardener has in ample supply. I'm a little worried about some of my new plants coming back next year after such a dry season, but you've reminded me to have faith. It took me a minute to understand the foul-weather blogger pun:) I think we're all a bit that way. I've been taking advantage of the last few beautiful days to get some fall chores done. But I'm done planting--lucky you to be able to plant off and on this winter! Sorry I always seem to be late in visiting...for some reason your new posts don't show up on my sidebar for a few hours. Maybe that's true of everyone's posts, but I just notice yours more because I'm looking for it on Mondays. I think gardeners are optimists by nature, we have to be! It occurs to me that the seasons when you garden is at its best are those when you probably enjoy being in the garden most. Isn't too hot in the height of summer to enjoy yoru garden, which might be why your have less interest then? Hi Gail, nature is just amazing. Harsh weather conditions, and still the natives thrive. I always try to be optimistic. Doesn't always work, but I try. I am working the garden and intend to be out at every opportunity during the winter months. I always have dreams......I always have hope.....I love my garden. Fun and maybe a little sad seeing the garden turn brown but like you said.... there's that promise of next spring. Gail this time of year I rely on the garden ornaments to give me the winter interest. I strategically place them in view of my windows so I can enjoy the snow art that covers them changing the look! Thia year it will be different being in the woodlands! Looking good Gail. But as we all know our gardens will whither & pass on but it's to give us an unusual show in the Spring. An awakening to all our senses. Yes, this is definitely the best time to plant for me, but I think I'm about done. I have a few more things to do, then, it's time to curl up with the catalogs and garden books and dream of next year. I really like your GOBN! I have a hillside I planted with the same philosophy, but so far it needs more maintenance than I planned on. Once the good plants become dominant, I hope things will suit my vision better. We're having a glorious fall here, and we must be out and enjoying it as much as we can while we can. Each day in the garden is that much more precious with the knowledge of how numbered the days of this gardening season are. It all looks very nice to me!